Christmas "break" has been anything but a break. With last minute shopping, gift wrapping, decorating, planning and of course baking, our family has been joyously busy. Add in a deluge bringing nearly half of our yearly San Diego rainfall in just a couple of days and we even have a bit of chaos! Hours of pounding rain, which is highly unusual for this area, raised my concerns during the night and my fears greeted me this morning as our normally sparkling blue pool waters now appeared more like our murky ocean. Luckily it is only a small slide into the water, but it looks like Daddy has a project today! Welcome to the Emerald City! Back inside the house Liv and I are making our lists and checking them twice! Guests arrive on Christmas Eve and we will be having 14 or so for dinner on Christmas Day. To be fully certain that we have enough holiday treats we have kept the oven cranking. Peppermint, chocolate, vanilla and orange are just a few of the aromas that have kept the men returning to the kitchen to act as taste testers. Most everything has been coming out beautifully with the only failure, and it is just a failure in looks, being a special Candy Cane Cookie that we were making for a friend. In Liv's usual zest for life she commented, "Don't worry Mom, looks don't matter because these taste awesome! And besides, they were really fun to make and we got to do it together." Can I just mention how much I love that girl??!! With our candy cane cookies using 4 egg whites we had 4 lonely egg yolks without a use. As I really don't like to waste we began a search for egg yolk uses. Knowing that whatever we found for egg yolks was likely to be calorie laden I pushed away any thoughts about "light" desserts and we decided to go big! Liv's search did indeed turn up a lovely calorie laden Vanilla Bean Creme Brulee which perfectly fit our needs! Calling for exactly 4 egg yolks, the additional calories come from the 2 cups of heavy whipping cream and sugar. 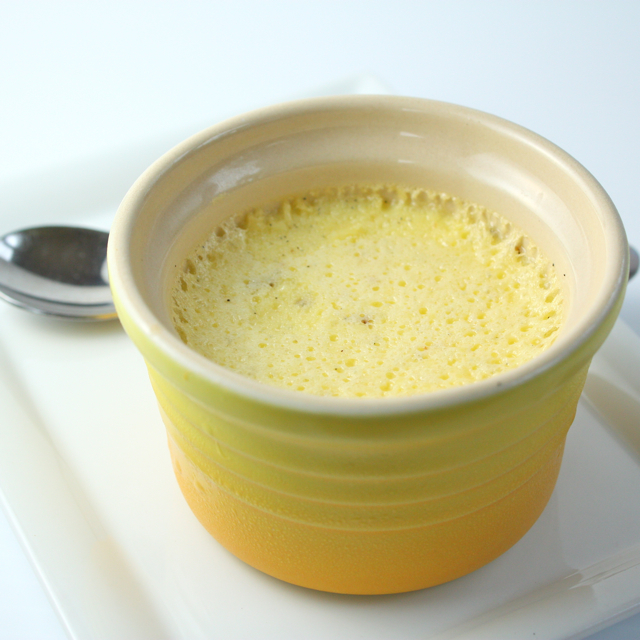 Reminiscent of ice cream custard, the brulee is amazingly easy to put together. A simple heating of the cream and vanilla beans on the stove culminates with the combination of the hot vanilla cream, egg yolks and sugar. 30 or so minutes later a beautiful creamy custard is ready for a chill in the fridge. Yep... it was THAT good! Pour the cream and milk into a saucepan over medium low heat. Split and scrape the vanilla bean into the cream mixture. Add the scraped bean into the pan as well. Heat the cream, stirring frequently, just until bubbles begin to form around the edges. This dessert is worthy of your best vanilla sources! In a mixing bowl whisk the egg yolks and sugar until pale yellow and the sugar has dissolved. 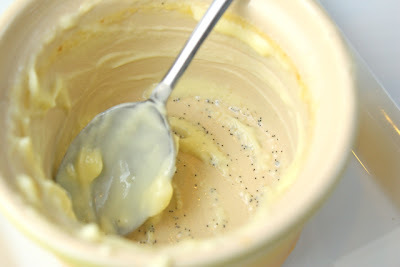 Add a small amount, maybe 1/3 or 1/2 cup, of the hot cream to the egg mixture and whisk to mix. Add another 1/2 cup and whisk again. Add the remaining cream (removing the vanilla bean pods) to the eggs and whisk. Add the vanilla extract, stir. Place six 5-ounce ramekins in roasting pan (I use my pyrex brownie pan!). Fill the ramekins with the custard mixture and then fill the roasting pan 1/2 way up the ramekins with very hot water. (To be safe, I removed one of the ramekins and slowly poured the water into the dish, then replaced the remaining ramekin. I can see myself pouring water into my precious brulee). Place the baking pan into the oven and bake about 40 minutes, removing, as Alton Brown so beautifully put it, when the creme brulee is set, but still trembling in the center. Remove ramekins from the baking pan and place in the refrigerator. Chill for at least 3 hours and up to a few days. Before serving, remove ramekins from the refrigerator. 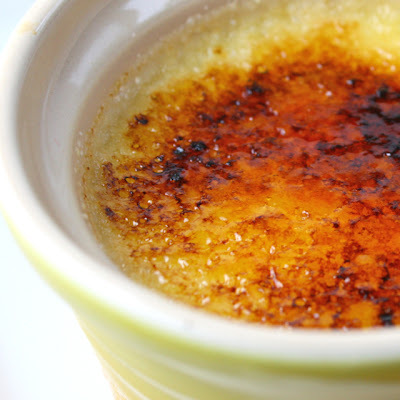 Top each creme brulee with approximately 1 Tablespoon of granulated sugar, tilting to spread evenly. Use a kitchen torch in a circular motion to caramelize, but being careful not to burn, the sugar. Let stand for about 5 minutes to allow the sugar to harden and serve. Serve alone or top with fresh fruit. Enjoy! Notes: Creme Brulee has always intimidated me, but it really wasn't hard!! My mom gave me a kitchen torch years ago, and I got about one good use out of it. Then it would never start again. This time I went to Home Depot and am happy to report that my industrial, not very pretty, $9 torch plumbers worked fabulously!! I have also tried to caramelize under the broiler without much luck. Note that if you do the broiler method, the sugar will go from white to burnt in a flash! Watch carefully. This is way too much work for me to make, but your photos look fantastic! Creme brulee is by far my most favorite dessert! I've only made it once, after borrowing a friend's kitchen torch... but now this has got me craving it more! I really need to invest in one of those torches because the broiler method just doesn't work for me! Your Creme Brulee looks so delicious. After eating this I would have been licking the bowl clean too. Olivia's comment about the cookies is so sweet. Wisdom from out of the mouth of our children is sometimes what it takes for us to realize that the joy is in the journey not the final destination. Making these cookies with you is something that she will remember long after the taste of them has faded. This is beautiful. I have never attempted to make creme brulee... I think I am afraid to! But I am impressed with yours. Not to mention, jealous of your pool. Sigh... Sounds like you are keeping busy, have a lovely holiday! PS. If you liked my nutter butter snowmen for your girlscout troop, you might like what I posted today as well! Ahhh, love Liv's comment. Talk about a glass half full! Merry Christmas!!! Tiffany... they really aren't that hard!! You've got to try!! Peggy, Head to Home Depot! Felice, what a wonderful comment! Yes, it' good to keep things in perspective and she most certainly did that. Emily, I was afraid too, but it really isn't hard! Kate, thanks! That's my girl, her glass is always full! One of my favorite desserts! Yours looks wonderful!!! Wow! Looks so fab and yummy!! 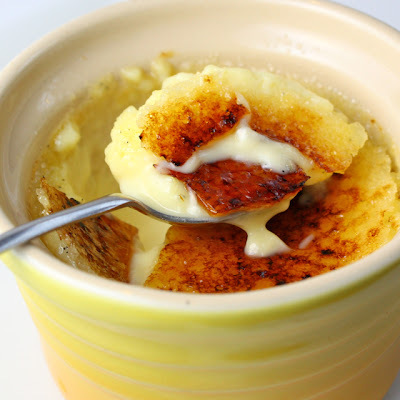 Creme Brulee is one of my absolute favorite desserts...so creamy and delicious! Sounds like you and Liv are having fun spending some quality time in the kitchen...I just got home to my mom's today and can't wait to bake all day with her tomorrow! Good luck with the big Christmas dinner! My boyfriend is OBSESSED with creme brulee, he would adore this! And about the rain in SD, whoaaa! I am out of town but it sounds crazy!!! Hope it stops soon and you can get your pool and yard back to normal. Creme brulee is a temptation. especially this crispy sugary top is irresistible. My husband loves Creme Brulee, but we don't make it too often, because of those calories. Liv is a gem, and you are so lucky to have such a thoughtful 12 yr old. I did hear about the rains in your area and was wondering how you were faring? Stay safe and i want to wish you and your familu a very Merry Christmas!!! PERFECT! What a perfect way to use egg yolks! Liv is so incredibly sweet, by the way. Doesn't that make your day?? My band aid for Christmas cooking this year is sprinkling powdered sugar on everything that looks less than par. Thank goodness dinner turned out good or I would have gotten some funny looks...I 'm glad you're enjoying yourself even though you're super busy. 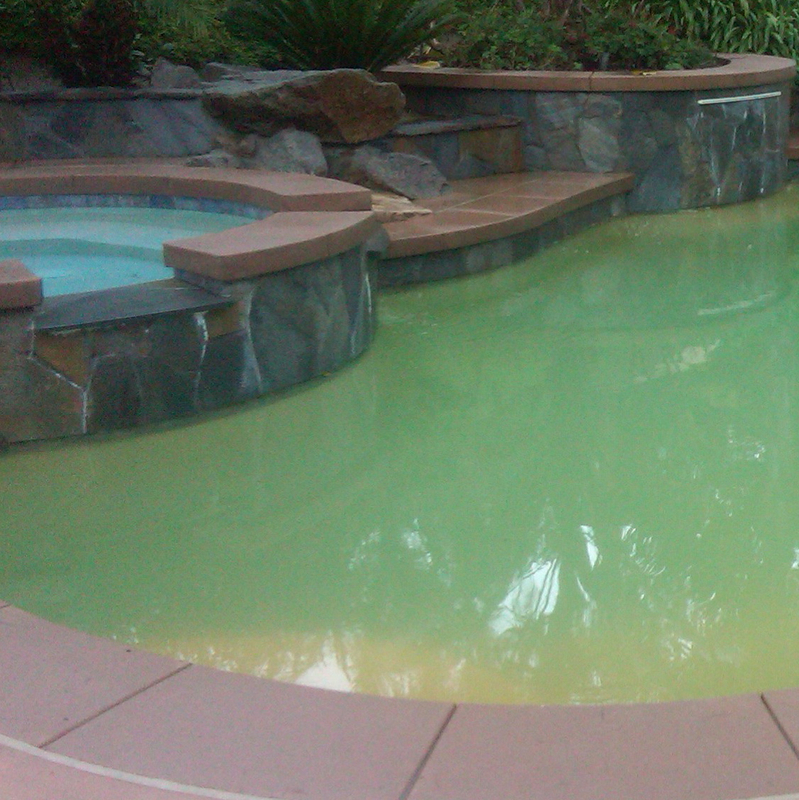 You can dye the upper pool (or hot tub?) red and you will SO be ready for Christmas! Oh I've always thought Creme Brulee was something extremely complicated to make. I don't have a kitchen torch, but I could include it in my birthday wishlist... ;-) I'd love to make Creme Brulee at home, especially now as I got a bunch of vanilla beans for Christmas. It looks fantastic! I LOVE creme brulee! Will be making this for our NY celebration. Can hardly wait to taste it!! Your pix are absolutely fabulous too! you did a great job.. the burnt sugar looks like something you order from the restaurant. Vanilla Bean Creme Brulee, sounds divine! My absolute favorite dessert! Plus I really have a thing for vanilla! This is one dish I have never made - I say it is my out to dinner treat!! Yours looks fantastic! Gimmie a spoon...stat!